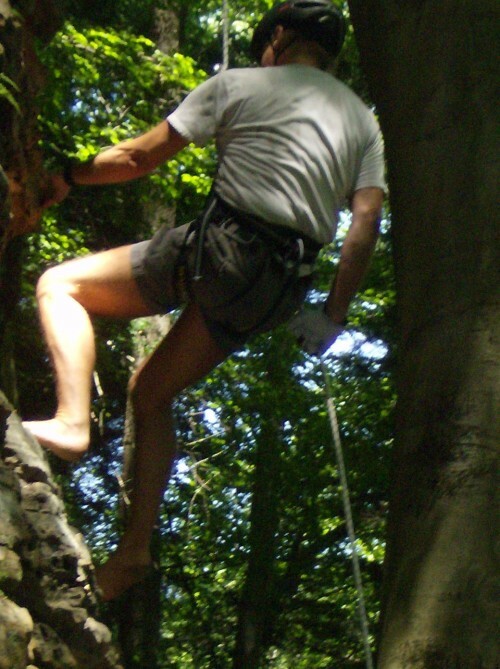 Rappelling is one of those things that is just a whole lot more fun while barefoot. 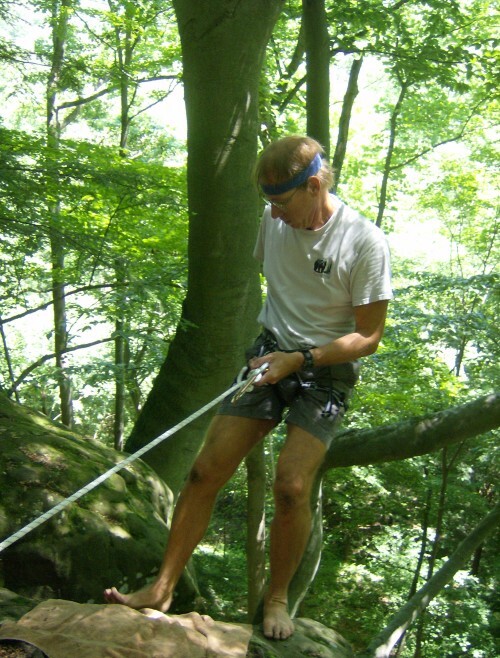 Don’t get me wrong — regular old rappelling is a lot of fun, too. But when you can feel the rock wall you are heading down, that adds just that extra touch . . . But for your feet? What purpose would a shoe serve? Because you are touching on rock? But if you do any barefoot hiking, you are stepping on rock, and putting your full body weight on it. When rappelling, the only force you are putting on the rock is enough to keep the rest of you away from it. That is nowhere near your body weight. It is minuscule in comparison. Your feet can handle that without breaking a sweat (of course, if they are in shoes, they spend the whole time sweating from being so horribly enclosed). 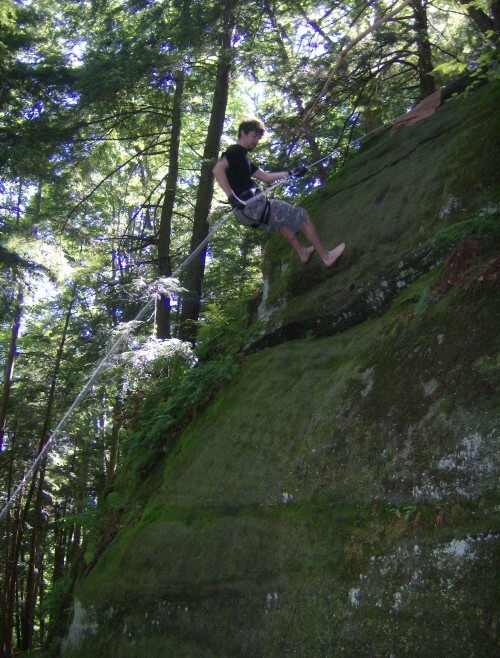 Instead, you can lightly dance down the rock face, enjoying the texture of the rock, becoming one with the sandstone. 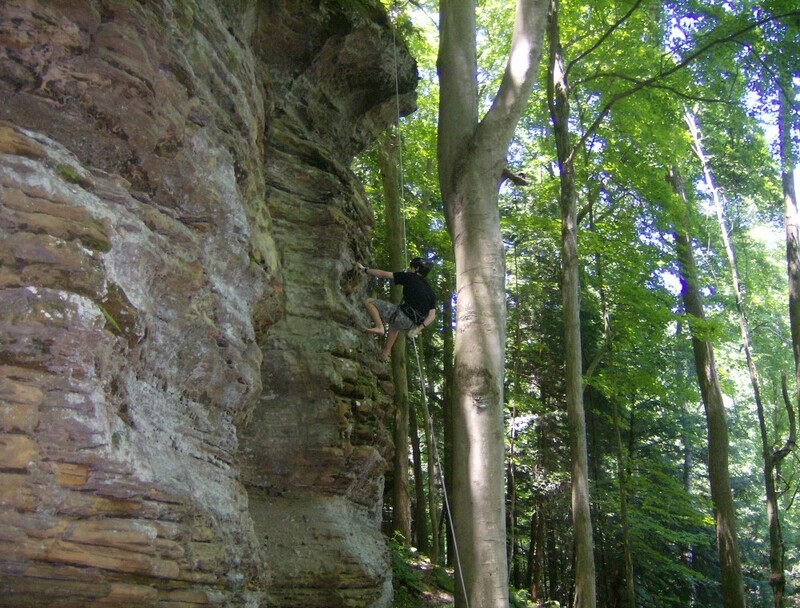 These pictures (of my son and me) were taken in Hocking Hills, at the Rockclimbing and Rappelling Area. Note that this was a repost (from June of 2011). And I have learned the word for “abseilen”. 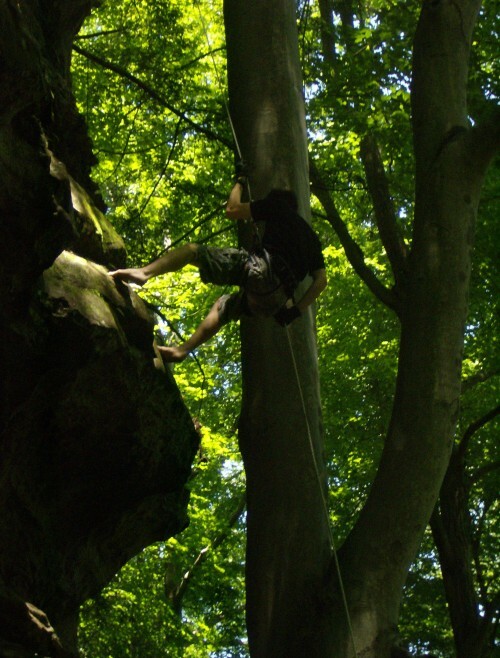 English “rappelling”, French “rappeler” (remind), German “rappeln” (rattle) are similar words meaning totally different things. It feels a bit odd at first, gloves but no shoes. But of course: wear them where you need them, and take them off when you’re done. A nice place, by the way, with some magnificent trees. Wow that looks fun. I’d love to try it.